Romhacking.net - Review - Much Better! 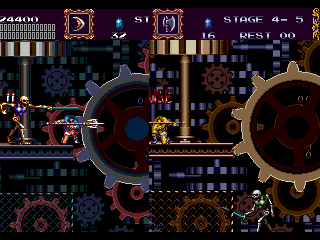 This patch aims improve the graphics of this underrated classic from Mega Drive. 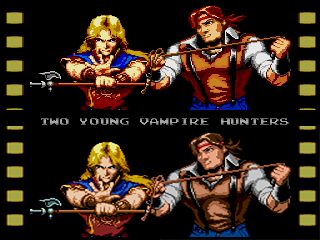 Konami made ​​questionable choices regarding the use of colors. Now everyone can enjoy the Bloodlines in all your glory, enjoy! The images do not represent how much this game has changed. All openings were thoroughly improved. Characters received new skin colors. 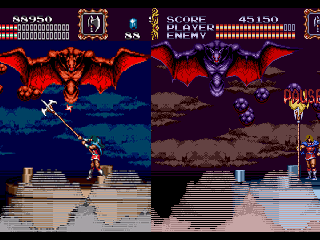 All enemies have received more appropriate colors and better shading. The stages received a new finish and are much better. The game was 100% modified and polished. This is a very nice enhancement to the original that I feel corrects some rather poor palette choices made by the original team. 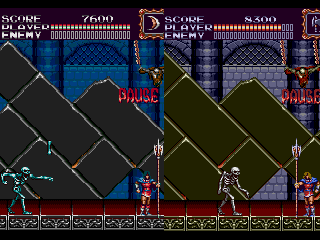 Much of the architecture and many of the enemies have more realistic palettes that help to put you a little bit more into the game while still maintaining the overall feel of the original. There are still a few minor issues here and there that should be fixed, but it’s still a great improvement.